You get the sense nothing Nashville Predators defenseman P.K. Subban can do will ever be good enough in the eyes of a select group of Montreal Canadiens fans. As his return to town looms, the Subban trade, which will likely hang over the city for a long while still, temporarily drops to the forefront. And justifiably so. 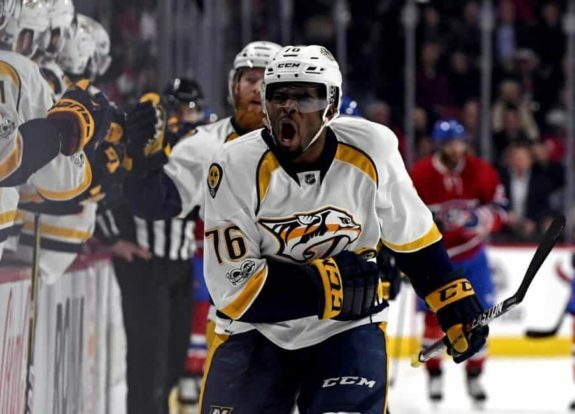 While Shea Weber impressively keeps his game at an elite level at age 33, Subban continues to be one of the best defenseman in the league at age 29, having reached a Stanley Cup Final and been nominated for a James Norris Memorial Trophy all in the two full seasons since the deal. Weber’s accomplishments haven’t been nearly as awe-inspiring. Nevertheless, Habs fans who support general manager Marc Bergevin and remain proponents of the deal point to his consistent production even after long stays on the injury reserve as proof that Weber can stay a force in this league for many years to come. Of course, it’s an undeniably positive sign Weber has amassed 11 points in 17 games since his return after missing essentially an entire calendar year with a few injuries. And those same fans can point to his superior point-per-game clip (0.65 vs. 0.57 for Subban this season) and the fact Subban has missed significant stretches in two of his last three seasons as proof the trade will still work out better for the Habs in the long term. You see, Subban has long been an analytics darling, while Weber’s stay-at-home style favors team defense. In fact, whether directly or indirectly since Weber has returned to action, Canadiens goalie Carey Price’s save percentage has improved significantly. Compare Price’s .923 save percentage in the games he’s played since Weber came back to his .908 mark on the season as a whole and it becomes clear how much Weber means to the Habs in theory. All that conveniently disregards Subban’s contributions to the Predators, though. He’s scored 112 points (29 goals) in 171 games for 0.65 points per game. 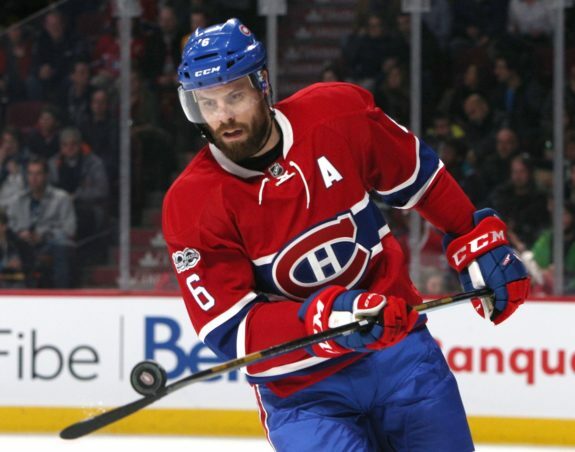 In Weber’s 121 with the Canadiens, he’s scored 69 points (28 goals) for 0.57 points per game. In the games Predators goalie Pekka Rinne has played with Subban in the lineup this season, his save percentage is .931, up from his overall .919 rating. So, if you want to dismiss analytics and conveniently ignore the argument that, by keeping the puck in the opponent’s zone, Subban is just as effective defensively as Weber, fine. Superficially, the stats still support the argument that Subban is having more of a positive impact on the Predators than Weber is having on the Canadiens. The excuse then becomes that you can’t compare the two, because the Nashville Predators are the better team. That’s the whole point, though! 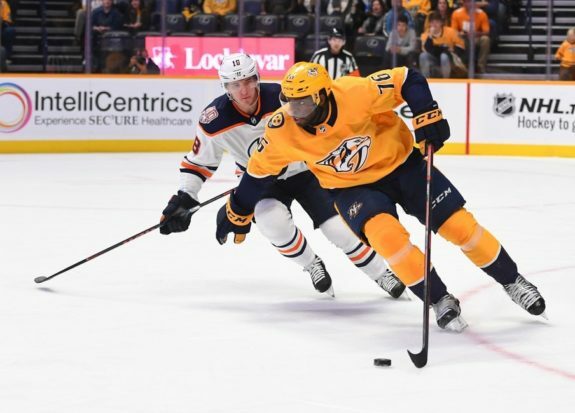 Subban’s Predators made it to the third round in his first season there and finished first in the Central Division last season (winning the Presidents’ Trophy in the process), both of which were franchise firsts. You can argue it’s all moot, because Subban alone isn’t responsible and David Poile acquired other players beside him to build the team into a powerhouse. That’s a flimsy argument for the simple reason no one of consequence besides Subban had been acquired by Poile for their run to the Stanley Cup Final. Sure, admittedly a lot of factors and variables entered into the equation. However, if you’re operating under the assumption Bergevin swindled Poile in the deal, only one of those two has been out of the first round since. Maybe Poile knows what he’s doing to a greater degree. And if Bergevin doesn’t know as much as many people think, isn’t is possible he made a mistake? Here, there, everywhere? In contrast, Weber, in all of his seasons with the Predators, never finished farther than Round 2 or higher than third in the Central. With the Canadiens, he does have an Atlantic Division title to his credit, but the team promptly got upset in lackadaisical fashion in the first round that season (2016-17). The Habs then crashed and burned in 2017-18, with him missing a significant amount of time. They are now fighting for a wild-card spot. However impressive the year-over-year turnaround has been for the Habs, the Predators are contending for the Stanley Cup yet again. Clearly the degree of team success each has had is vastly different, with Subban holding a huge advantage in that category, which is hard for the droves of haters who believe he’s a cancer in the dressing room to explain. So, they either ignore it or argue Subban was a locker-room cancer until the trade set him straight, all the while continuing to level criticism his way for his larger-than-life personality. Huh? Wasn’t that personality the reason why he was a cancer to begin with? And he’s no longer a cancer, even though he still has it? Because that personality’s the only real proof any critic of his has as to why he’s a problem child, as they’ve almost certainly never been in the team dressing room themselves. Ex-teammates who actually have, like Dale Weise, Devante Smith-Pelly and Ben Scrivens, meanwhile say the opposite. Add to that his charity work and maybe, just maybe, Subban wasn’t the problem after all. Unless of course you find fault with how he only pledged $10 million to the Montreal Children’s Hospital and didn’t donate it outright. What a bum. Hey, maybe it was all to curry favor with the Canadiens to be named captain instead of Max Pacioretty. Even though those same conspiracy theorists argue it’s in part why he was traded, because he went around the Habs to make the pledge, stepping on toes in the process. Silly Subban. Doesn’t he know there’s a right way to donate as much money as he did? When literally no Canadian professional athlete has ever donated as much money as he did? Subban will literally go down in history as the first one to commit such an insane amount of money to a good cause and yet he can’t win. Ironically, even if they amount to the smallest of sample sizes, it’s games like the head-to-head match-up between the Predators and Canadiens on Saturday that seem to mean the most. And he comes out on top there too. Subban and the Predators are 2-1 in games against the Canadiens, with two assists in all. To be fair, Weber is 2-0 with one goal against the Predators. In the lone game Subban and Weber have faced each other playing for their new teams, Weber was held pointless in a winning effort. So, consider the upcoming game Round No. 2, after which Subban will have evened the score or Weber will have proven beyond a shadow of a doubt that he is the superior player between the two. Clearly. For the record, Weber is a superior player in general. No one is debating that. 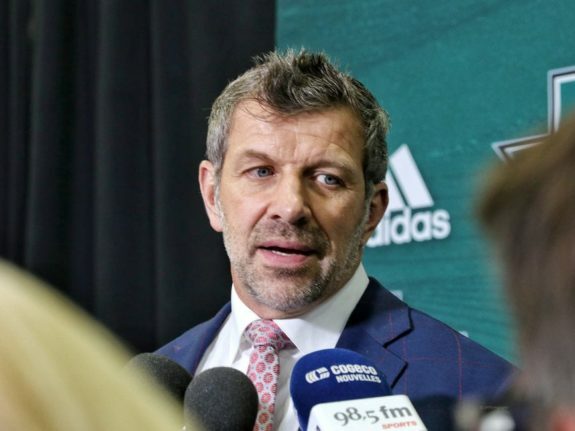 Compared to Subban, everyone is though, because the trade serves as justification as to why Bergevin must be fired or is a great GM, depending on which side of the argument you fall. At the end of the day, it isn’t about Subban. It can’t be, because newsflash: Subban is no longer a member of the Canadiens. Maybe it’s time to focus on the achievements and failings of those still in the employ of the team, like Bergevin himself. He can still control its fate, which is why a win against the Predators is so important. Not because the Habs will have beaten Subban, but because it helps in the standings and contributes to the playoff berth Bergevin so desperately needs. Subban on the other hand should need nothing more from the Canadiens. He’s proven all he can and if it isn’t enough, it never will be.